Engaging our masculine and feminine energies for joy, power, and peace​. You want to feel calm, centered and in control, right? But how do you do that when each piece of news you hear feels like another blow? You feel overwhelmed, out of control, and crave balance and clarity. And what used to work for you, just isn’t cutting it. If you're a woman too often you feel over-worked and over-reactive, on the defense to protect yourself from the next thing. You hate feeling like a victim, and you don’t want to sound perpetually angry. If you’re a man you're likely frustrated and confused about how to show up in a world that wants you to be strong, but condemns you if you’re too powerful. You feel like you can’t win. And the examples out there of what the masculine looks like have absolutely no appeal. It’s not your fault: the traditional gender roles you were taught are crumbling, so what do you do? The solution: you must tap into both the feminine and masculine energies within yourself, and harness the best of each to create balance and a more unified personal strength than you have yet know. - a practical understanding for how to live into the dynamic joy that is your birthright even in the midst of turbulent times. We're in a confusing time!! Women have more opportunities to excel, to be anything we want without the limitations of previous generations. But too often I speak with women who are at least as over-worked and under-pleasured as their grandmothers were. We have fewer restrictions on who we can be, but far higher expectations for ourselves! And too many men have lost their center, either trying to compete in a world that could care less about what's actually healthy and wholesome to their being, or in trying to keep from acting like the usual macho jerk, they depress their own healthy masculine energies and lose their attractiveness as a man. I've been writing and thinking about feminine energy for over a decade. The Taoist philosophies and qigong practices I was studying seek to understand the interplay between opposites within a unified whole. We know these as yin/yang or feminine/masculine. But after the election in 2016 and the shocking behavior of our president-elect I began to articulate more clearly the kind of masculine energy I wanted in our leaders, whether they be male or female. Don’t be confused here. When I talk about the masculine and feminine, I'm speaking about energies, not genders! Ideally humans learn to identify, strengthen, and harmonize both our masculine and feminine inclinations for a life of greater joy and wholeness. Yin and yang energies live in every aspect of nature, and in all genders. Sometimes they work together to bring a sense of satisfaction and ease. But like a see-saw, equal balance is rarely possible. We’re most often either focused in one direction of the other. We’ve been raised in a patriarchal culture that values the masculine energies of productivity and efficiency over those of nurturance and spontaneity. Competition is prized over collaboration, goal over process, and the rights of the individual over those of the collective. Often we don’t notice this imbalance, except when things start falling apart and our happiness turns to dissatisfaction. When our success is built on hyper-masculine behaviors, we can’t help but find our lives skewed toward force over inspiration, the rational to the exclusion of the intuitive, what’s most efficient and practical over what brings real joy. In the era of Trump we have a poster-child for what immature masculine energy looks and feels like. Dominating, arrogant, and condescending treatment of others is the outward display of success a culture that still so thoroughly devalues and dismisses the feminine. When these yang energies lose their internal integrity — when they become unhealthy or fail to mature — we see them in our culture and ourselves as self-abuse; isolation; and harsh, perfectionistic, or dogmatic attitudes that rob us of the connection and pleasure that the yin energies bring to our lives. At those times what we most need is the healthy feminine! 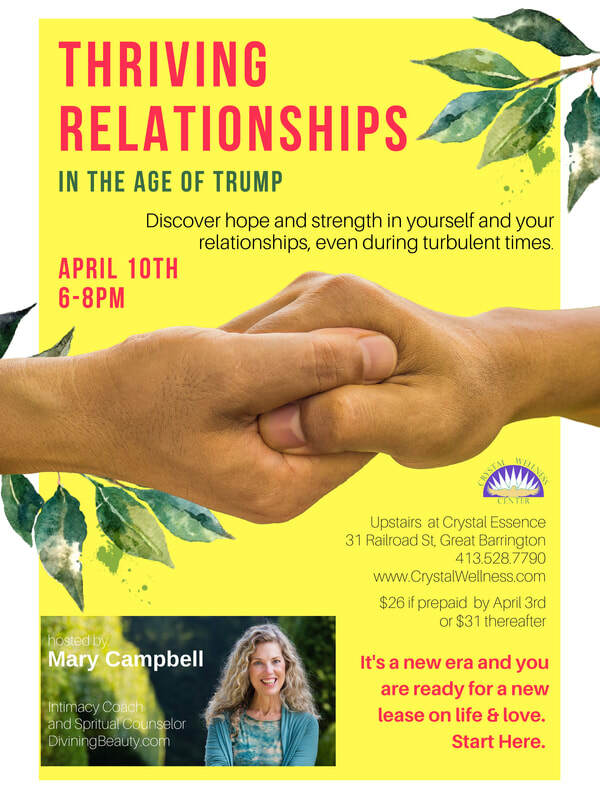 But out of desperation, we can fall into attitudes and behaviors common to the hyper-feminine: despair, loss of libido, obsessive self-doubt, helpless-ness or over-indulgence. Many of us bounce back and forth between those polar extremes, obsessively over-working and then vegging out in our most habitual way, maybe binge-watching a show with a spoon in one hand and a pint of ice cream in the other. We push too hard in the hyper-masculine, then zone out in the hyper-feminine, just wanting to forget it all. Then we panic, flood ourselves with guilt and remorse, and rush back to over-working. Or we languish in despair. This cycle exhausts us and minimizes our joy, inspiration, and effectiveness. We lose any internal sense of what would be healthy and reviving. Instead of allowing our less-than-whole, obsessive, fear-induced tendencies to drive us, what we most need is to allow ourselves to be held by healthy masculine actions — structured, purposeful, courageous — in order to teach us how to surrender and relax into our healthy feminine receptivity and joy. In the same way, when people — no matter their gender — authentically honor their own nurturing, reflective, gentle feminine, then there’s no need to lapse back into the abyss of their obsessive, harsh, controlling and uber-independent hyper-masculine. Yet in a culture that would rather have us buying and spending so we don't feel the pain of it all, making that shift takes guidance. That's the work that's become my life's calling. You'll see below the graphic I've created to show visually the extremes (in darker colors along the outer edges) and the healthy harmonies set against the paler colors, closer to the center. 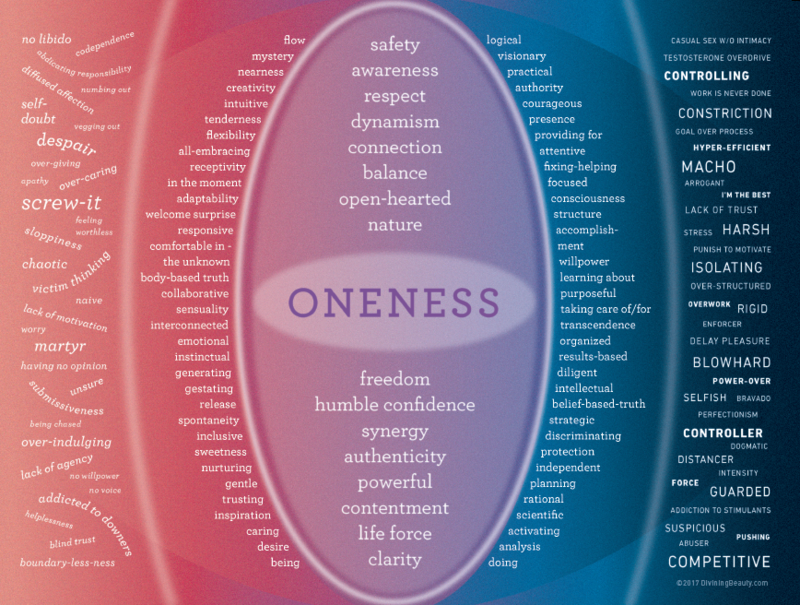 The center column represents the resulting optimal harmonizing of the yin/yang or masculine/feminine energies.